Saturday 2nd July, all ready to have an amazing time and they sure did. It was a fun-filled, energetic evening of music, dance and great food. Every single person made a fantastic effort to dress up in bright, colourful, traditional Indian costumes and they looked great. 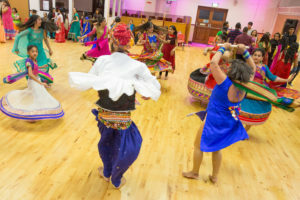 The evening began with a workshop with Nimisha Parmar from Sadir Arts Leicester who spent a couple of hours teaching people how to perfect their Garba and Dandiya Raas moves from those who were completely new to those who wanted to become experts. Veena Pankhania of Perlle Events took to the main stage at 7pm and opened the event by introducing what 7events was about. She spoke of the 4 charities 7events is supporting (LOROS, The Teenage Cancer Trust, Bone Marrow Transplant Unit and Joe Humphries Memorial Trust) and reminded us all why we were there! After a great introduction, Suchak Events who were providing the music, got the crowd going with the 2-Thaali Garba. As soon as the music started, everyone jumped up and joined in a near perfect circle to kick off the main event. It was an amazing sight to see so many people dancing in sequence and collectively and having a fantastic time while they were doing it. choreographed performances. 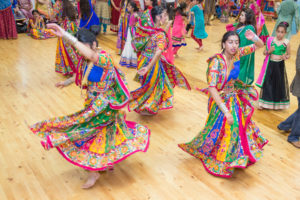 The first was from the Maher Girls Garba Raas Group* – a Leicester based group of young women who left the crowd gobsmacked after an exciting and polished performance. No one would have guessed that the youngest member was only 8 years old – she was fantastic! It was a great performance and a true tribute to our ancestors with a medley of traditional outfits, songs and dance routines. Next up was Raas Rebellion**, based in London with members from all over the country, they also looked incredible in their traditional costumers, headwear and make-up. This was a performance with a slight twist, the dance group took the audience through a journey of different styles of Garba from different eras and parts of India. Their performance wowed the audience too with their authentic style and some daring moves which grabbed your attention. 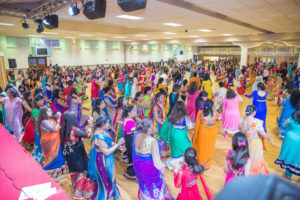 Next up, Suchak Event started off the 3 Thaali Garba, watching the professional performances got everybody excited and within seconds, most of the audience and the dance groups were on the floor dancing away with lots of energy and passion. Whilst everyone topped up their energy levels with the food provided by Pau Bhaji, Sara Foods and our amazing cooks, we did our raffle and gave away some fantastic prizes which included meals in top restaurants, gold earrings, sarees and a pair of tickets to see the legendary Asha Bhosle! The prizes were presented by the one and only Kash Kumar from Sabras radio and they made some people very happy! And finally, we had 45 minutes of Raas, the music really got the crowd going and the sound of the clinking dandiyas and cheering was brilliant to hear. We couldn’t have asked for a more perfect end to a spectacular evening! By the end of the night, there were loads of tired but happy people and we can only describe the event as a huge success. After counting up the takings, we were overwhelmed with the amount we raised which was an outstanding £5,546 for the 7events campaign so we couldn’t be happier. This will allow us to reach our goals and will provide the various communities a chance to witness what different cultures Leicester has to offer! So when we said “Grab your bangles and your dancing gear…” we were not let down by the people of Leicester and the wider community – Thank you to everyone who made this happen, we couldn’t have done it without you! 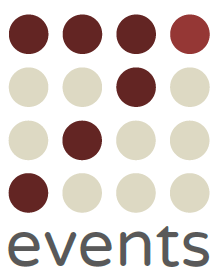 This entry was posted in 7events, Campaign one, Community, Fundraising, Raas Garba. Bookmark the permalink.